Kiyoshi Kurosawa’s YOCHO (Foreboding) is a second trip to the well that gave us Kurosawa’s previous BEFOE WE VANISH. This time Kurosawa enlisted Tomohiro Maekawa the writer of the source play for the two films to help him craft this story of the first stages of an alien invasion. Conceived as a TV series companion to the earlier film it was then cut together and over an hour of material was removed. The editing is so well done that I would be hard pressed to know that it was ever five separate episodes, or that anything was missing. This film plays as companion/prequel/riff/meditation on the earlier film and its concepts. The film follows a woman who finds herself dancing at the point of an alien invasion, though he doesn’t know it at first. First a co-worker is afraid to go home. She warns there is a ghost there. It turns out the woman doesn’t recognize her father and has lost all concept of what a family is. Next her husband is acting a little weird, as is her boss at work. I’ll leave it for you to see how it goes together. 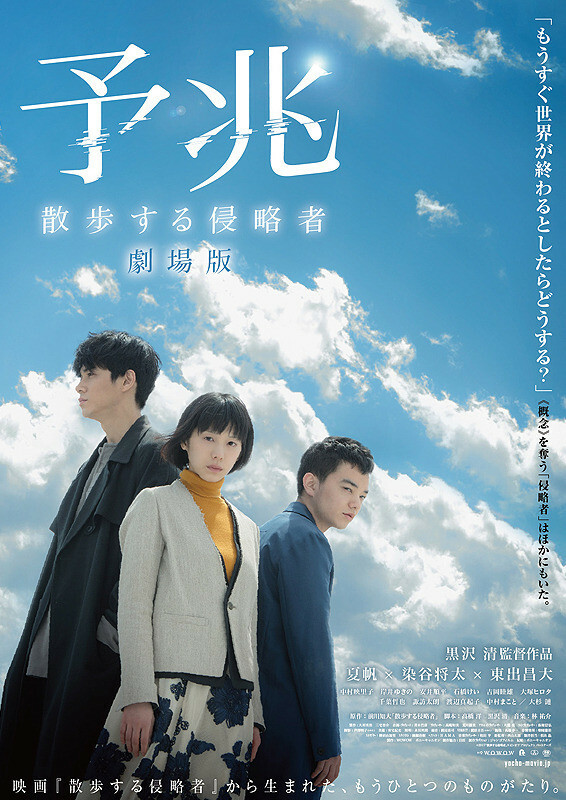 More leisurely paced than the earlier film and drifting in and out of nooks not investigated in the previous film YOCHO has some food for thought. What the aliens are doing (stealing concepts) makes for interesting post screening discussions. I saw this film at Japan Cuts with friend and Unseen Films writer Joe Bendel, and our walk back to the subway was one long talk about the film and it’s ideas. The problem for me is that this time out the 140 minute run time, and a structure that started as a multipart TV series causes the film to drag. Things loop around to fill time. With time to fill our minds begin to wander and the problems with the plot and even the basic flaw of the alien theft of “concept” rears its ugly head. How can you steal a concept when one concept is tied to all the others we hold. How can you understand say the idea of family if you don’t understand all that goes with it. Even the notion of hatred doesn’t work if you don’t know what all the other emotions are. It got so bad that I was wondering why the aliens were doing it since it makes no sense (never mind that it is handled in BEFORE WE VANISH) in the context of this film. Additionally it’s clear that the budget was minimal with most of the film taking place in mostly empty locations with only the main cast. The city where the action takes place is pretty much a ghost town before the aliens show up with people only showing up if a scene calls for it. It is really noticeable when the otherwise surprisingly empty hospital develops a huge crowd in the lobby for a single scene where the alien doctor walks though and causes everyone to collapse. The scene brought roars of laughter from the audience at the Japan Society for any number of reasons. While not a bad film, it never rose above being just OK for me. Having seen a good chunk of Kurosawa’s other films I would consider this one of his minor films or one of his doodles where he farts around with a concept to see where it goes. While any of his lesser films is better than most directors best films, so I’m glad I saw it, but at the same time it isn’t anything I need see again.